B.PAC submitted its strong objections to BESCOM’s proposal for increase of electricity tariff for FY-19, during the Public Hearing held at Karnataka Electricity Regulatory Commission (KERC) office. T.V. Mohandas Pai, Vice President, B.PAC and Archana M V from B.PAC team made the submissions before the commission today during the public hearing conducted by KERC. The tariff proposal by BESCOM for FY 20 by INR 1.01 / unit has been proposed stating a deficit of INR 2933.82 crs for FY 20. B.PAC’s analysis has shown that this deficit is arriving mainly because of the increased projections in the power purchase cost for FY 20 by 33 % from FY 18. The projected cost for KPCL Thermal has increased by 73. 51 % from FY 18 and the projected cost for CGS energy has increased by 42.34 % which amounts to INR 12358 crs. The deficit estimated for FY 20 is highly inflated to mislead the Commission and consumers. The deficit of INR 2933.82 crs for FY 20 should be disallowed by KERC. For the above-mentioned reasons, the Commission should not accept the proposal put forth by BESCOM requesting increase in the tariff of INR 1.01 for FY 20. The Commission should direct BESCOM to submit realistic projections and also bring discipline in procuring power at low cost. While revenue has increased by 6.7 % (INR 18042 crs from Commission approved of INR 16914 crs), the Power Purchase cost has increased by 11 % (INR 15123 crs for from the Commission approved INR 13624 crs) – disproportionate increase in PPC. B.PAC’s Prayer to the Commission: We request the Commission to disallow the variation in distribution loss of 0.67% (173.9 MU) amounting to an excess loss of INR 120.74 crs. BESCOM has realized higher (INR 6.94 / unit) rates than what was approved (INR 6.48 / unit) because of change in the mix, and, average power purchase cost has been higher (INR 4.84 / unit) than approved rates (INR 4.41 / unit). The APP for FY 18 was 4.84 / unit whereas the as per the IEX, power was available at INR 4/ unit. This indicates poor planning and incapability of BESCOM to buy power at lower available market rates. The gross margin (difference between revenue from sale of power and PPC) has been continuously increasing from 7.87 % in FY 14 to 16.18 % in FY 18 . The percentage of PPC to revenue has increased to 87. 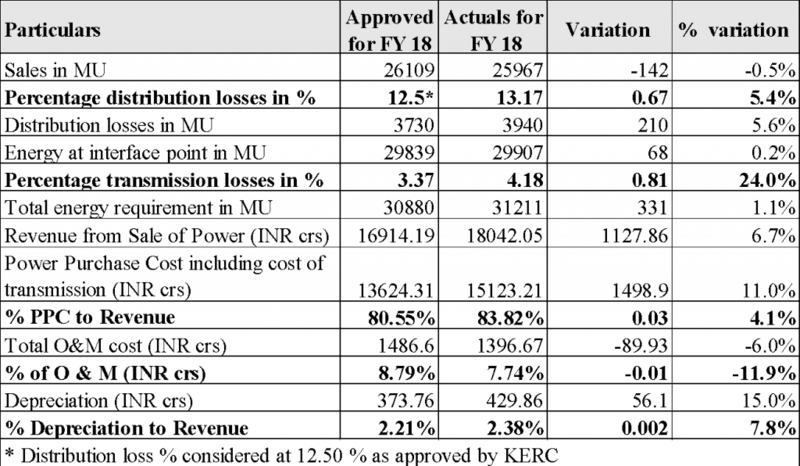 5 % as per the estimated actuals of FY 19, and is projected to increase to 97.06 % (FY 20) and continue to increase through the fifth control period – 102. 64 % (FY 22). No business can be sustainable with costs being higher than the revenue. We request the Commission to direct BESCOM to bring down the percentage of PPC to revenue to 80 % or below and not allow any further increase in the ARR for FY 19-20. Consumer protection is one of the primary objectives of the KERC, we urge KERC to take notice of the above data-based insights and not allow BESCOM to pass the burden of its inefficiencies on citizens through its FY-20 tariff increase proposal. BESOCM already has been realizing higher margins over and above the approved limits set by the KERC. 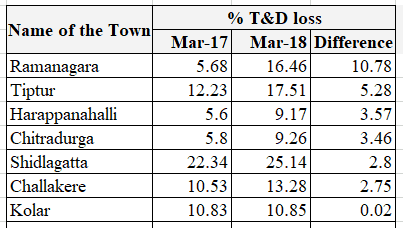 While we welcome the efforts by BESCOM to reduce the T&D losses, it is disheartening to see the continued T&D losses in Ramanagara, Tiptur, Harappanahalli, Chitradurga and Shidlagatta towns and sub divisions. We urge the Commission to set targets for T&D losses at each zonal level for BESCOM and then narrow down to division and sub-division level instead of aggregating it at BESCOM level. For KPCL Thermal, we note that the actual per unit cost is INR 4.32/ unit (FY 18), while Commission approved was INR 4.34/unit. 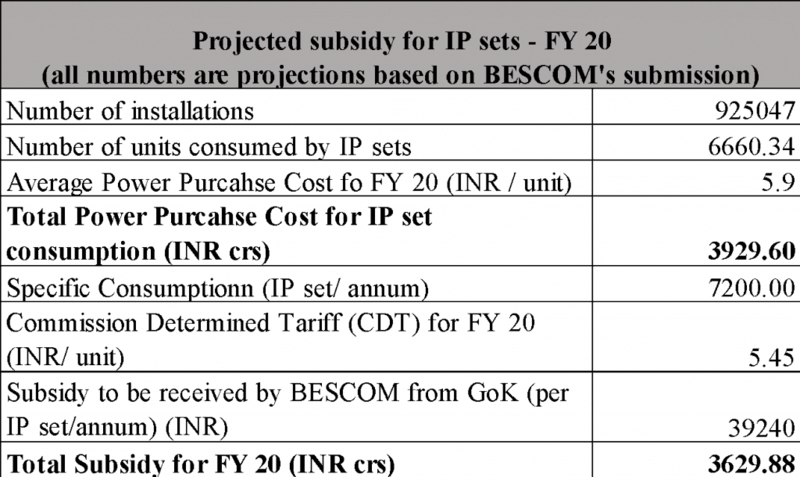 Whereas, for FY 20, BESCOM has projected per unit cost for KPCL Thermal as INR 6.36 / unit. This excess cost should be disallowed by the Commission. We request the Commission to not to allow the increase in power purchase cost which has been brought about by increase in the cost of power procurement mainly from CGS Energy and Short- and medium-term purchase. We request the Commission to disallow the increase in power purchase cost of INR 1102.05 for truing up for FY 18. The number of installations in the HT category, although has been increasing YoY, the number of units sold has been decreasing. The Commission should direct BESCOM to take note of declining HT consumption and probe into the matter to suitably cater to this segment. BESCOM has submitted that as of September 2018, it has achieved only 0.24% of metering of IP sets. In the interest of controlling the leakages in the distribution channel, we request the Commission to pass an order directing BESCOM to expedite the process of metering all the functioning IP sets for the current control period and submit the annual progress to KERC. In our FY 16-17 submission to the KERC, B.PAC had requested the Commission to not to consider regularization of illegal IP sets for any cross subsidy or tariff hike to be paid by other customers. Through the Commission we request BESCOM to furnish number of identified illegal IP sets in FY 18 and actions initiated against such consumers. As the Hon’ble Commission may be aware that, there exists duplicate and multiple IP set per farmer. B.PAC had requested the Commission to identify and remove such IP sets to avoid subsidy to the rich. In our present submission to the Commission, we would like to reiterate the same request in the interest of other consumers who are diligently paying for their single uses. The Hon’ble Commission had directed the Government of Karnataka to formulate a suitable policy to implement the suggestion of direct remittance of subsidy to farmers it it’s FY 17 order. However, to the best of our knowledge, GoK has not yet formulated a policy. We request KERC to advice Government on this matter so as to enable proper accounting of energy and also facilitate accurate computation of losses in the distribution system. BESCOM sales month outstanding for FY 18 is 6.51 months. The Commission has approved three months sales outstanding for BESCOM to complete the reconciliation of collections. However, for FY 18, the BESCOM is lagging by 3.51 sales month. If one considers 10 % interest rate on this outstanding amount, it works out as INR 527.73 crs. We request the Commission to not consider this amount for truing up exercise. BESCOM has made accumulation of INR 1135.76 crs towards doubtful debts for FY 19. We request the Commission to disallow the variation in distribution loss of 0.67% (173.9 MU) amounting to an excess loss of INR 120.74 crs. We request the Commission to not to allow the distribution losses calculated by BESCOM considering the approved loss at 13 % instead of 12.50%. We request the KERC to direct BESCOM to provide revised submission on realistic projections of power purchase cost to revenue for the current control period. The BESCOM had made provision of INR 1173.51 crs toward doubtful debt. We request the Commission to direct BESCOM to provide clarification on amounts recovered for FY 17. The deficit amount for FY 20 is highly inflated to mislead the Commission and consumers. The deficit of INR 2933.82 crs for FY 20 should be disallowed by KERC. We request the Commission to direct BESCOM to furnish the details on the CCS from each tariff category before passing the tariff order for FY 20. We request the KERC to set up an expert committee to draw a five-year roadmap for all the ESCOM’s to determine charges for a long term, instead of setting an annual tariff. Link to detailed presentation submitted to the commission during the public hearing on 4th February, 2019.